The use of microfibre cloths has become synonymous with green cleaning. There is, however, a vast difference between using a cheap ‘microfibre’ cloth with a chemical product, and professional microfibre technology with water only. When I question why people use a chemical with a methodology designed to be chemical-free, they argue that microfibre doesn’t work without it. I then look at the flimsy, grubby ‘microfibre’ cloth being used to clean a whole building, and suggest that perhaps they were expecting miracles. This article answers four questions I’m constantly asked about making microfibre work effectively without chemicals. 1. Why Use Microfibre Technology Without Chemicals? 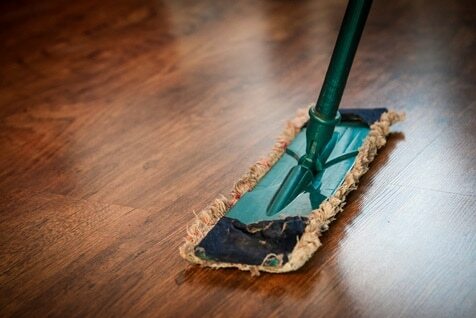 It’s pretty hard to call microfibre cloths and mops (tools) ‘green’ if used with normal chemical products. In fact, the use of a sustainably-sourced, non-toxic, concentrated and biodegradable chemical may have less environmental impact than a cheap synthetic microfibre cloth that is manufactured with poor environmental controls, and thrown away after a few days. Removing surface contamination and preventing it from spreading while cleaning. Being lighter, easier and more ergonomic to use than wring mops, and leaving the floors dryer, microfibre mops should also reduce the risk of strains and slips and associated injury-based costs. Gordon also carefully controls the whole cleaning process: its supply, storage, training, handling, testing and maintenance. I call this ‘managing the cleaning life-cycle’. Which leads us to the second question – how to address microfibre and water’s biggest barriers – upfront costs and change management. 2. How To Address The Barriers? As professional microfibre equipment can cost ten times more than its cheaper cousin, the most obvious barrier is cost. At St Vincent’s Health Australia the outlay was $2,500 per ward. But as Gordon pointed out, these upfront costs were negated over time via its extended durability and reduced chemical, waste and lost work time costs. Monitoring through extensive internal testing, its tools perform at peak for an average one and a half to two years, and are then transferred to administrative offices, thus extending its life-span. In a health and aged care settings, reusable microfibre is generally restricted to environmental cleaning applications. However, with the addition of anti-bacterial nano-silver, disposable microfibre and/or steam equipment, microfibre methodologies are being tested successfully in some hospital clinical areas and infectious rooms, such as Southern Health and Monash Health facilities. The facility or contract size, limiting the return on investment. It takes time to research, plan, implement, train and monitor an effective system. It also requires a willingness to shift the perception of management, or clients, to make such an investment in professional microfibre. Probably the biggest barrier to microfibre is when an investment fails. Not training cleaners, or providing them with a system to ensure microfibre is used correctly, means they may continue to use cleaning products which clog or even destroy the tools, or they end up in land-fill prematurely by falling into the waste cart. But failure is most often due to insufficient numbers of tools provided to clean with and a woefully inadequate laundering system. 3. How Do You Use Microfibre Properly? Supplying a few microfibre cloths or mops per building that are rinsed under the tap ‘on-the-go’, is not cleaning – it’s ‘dirtying’. It spreads germs and soil around, causing smears and dullness, which is then blamed on the tool (this applies to wipes or mops with chemicals too). The face of the tool contacting the surface must be clean, and cross-contamination from one surface/area/tool to another must be prevented. Tools must be washed within 12 hours of use and immersed in warm water before all soil particles can be released. Not only is this essential for good hygiene, but embedded soil will risk damaging surfaces and bacteria will ruin the fibres. Using a low-foaming laundry detergent that does not contain bleach, softeners or zeolites. Drying in a cool dryer (or air-dry if facilities and time allow). A commercial washing machine should be installed on the site, or at a centralised location, or tools sent to a commercial laundry. 4. Is Microfibre Technology Becoming More Accepted? In writing this article, I interviewed several suppliers as well as end-users. They told me they were seeing a growing demand from building owner/occupants toward microfibre as a viable cleaning methodology, and that there is awareness that it needed a fully professional system and training to ensure it worked effectively. So, as that old saying goes: ‘a bad workman blames his tools’ – but it helps to buy quality tools in the first place. Keeping your workplace clean and green is easier than you think as greener cleaning alternatives are available like Microfiber Mops and Ecosafe Parts Washer. No need to use harmful chemicals. Switch to safer and more economical cleaning! Learn more.